There are many kinds of natural stone countertops you can get as part of your kitchen remodel. Each type of stone has its own advantages, but you should seriously consider the perks associated with slate countertops. It will give your kitchen a distinctive aesthetic, and you could actually end up saving money in the long run when it comes to maintenance work. One thing to consider is that slate works with virtually any design. No matter what kind of vibe you want to have throughout your home, you can be certain slate will fit right in. It offers a highly uniform appearance, and although it is noticeable, it never overpowers a room. Whether your house is contemporary or traditional, slate will make a fantastic addition. Additionally, countertops made out of slate are highly resilient. Most natural stone countertops are durable because stone is able to withstand many forms of damage. Even if something gets dropped on the surface, you can be reasonably confident there will not be a mark left behind. One thing to take note of is the fact that slate countertops can be porous. That means it is more likely to stain. However, steps can be taken to limit stain’s effect. A factor that will definitely come into play is the price tag. 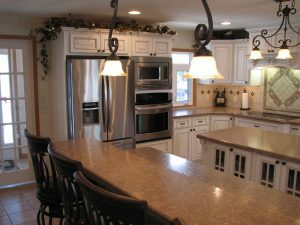 A lot of homeowners are hesitant to get natural stone countertops because it is usually much more expensive than other types. However, slate tends to be one of the more affordable stone options. Ultimately, the final price tag will depend on how many square feet you need installed. You will need to clean the slate every once in a while and get it polished to ensure it retains its beauty. However, you are bound to find that slate meets many of your requirements for a new kitchen remodel addition. Talk with your contractor about getting slate countertops installed.